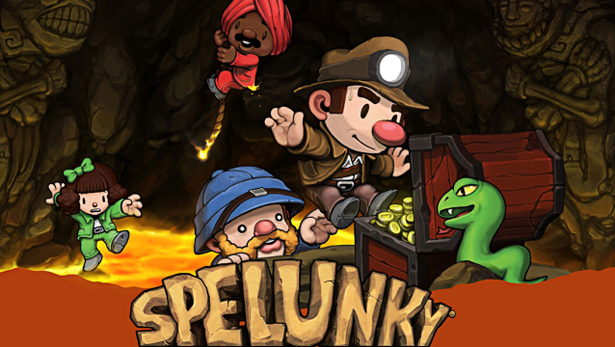 Spelunky is one of the most infuriating games I have played all year. It’s also ridiculously fun and insanely addicting. 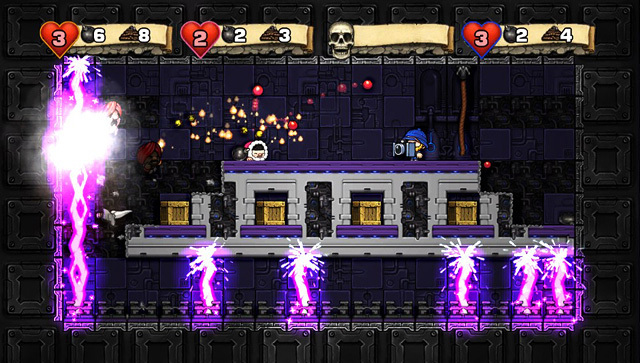 Originally a 2009 PC game, the 2D cave-exploring sensation known as Spelunky received an enhanced release on the Xbox 360 last summer. Last month this upgraded edition made its way back to PC while also hitting the Playstation Network for the first time. The PSN release happens to be a cross-buy title, meaning one purchase nets you both the PS3 and Vita versions. For the sake of this review, I focused on the Vita, and for good reason: Spelunky is especially efficient in bite-sized gaming sessions (and it’s only ~100 MB!). The game’s general concept revolves around you, an unnamed adventurer, who must make his way from top-to-bottom in a series of randomized dungeons, all while collecting loot and upgrades along the way. Each level is full of a wide variety of dangers. The first world, the mines, is filled with snakes, spiders and spikes, just to name a few obstacles. Falling into the spikes results in instant death, forcing you to start all the way back from the beginning. Later worlds, such as the jungle and an ice cave, present even graver difficulties. Every new game starts you off with four hearts (touching an enemy = loss of one heart), four bombs and four ropes. The bombs are incredibly helpful for paving your own way through each area, and they can be used to wipe out enemies and find hidden treasure. The ropes are used to get to locations unreachable by jumping, or to descend lower without having to take a huge fall. More of these items can be found within each level, and occasionally a shopkeeper even shows up with new upgrades for sale. His items are random, and they range from machetes to jetpacks to cameras, all of which can be crucial survival tools. Each level has its own little quirks and secrets, and because of its randomized nature, you never know what you’re going to get. There is one constant, however; hidden somewhere in each level is a damsel in distress (which can amusingly be turned into a pug in the game’s settings). Rescue her and you’ll get one extra heart added to your life — these are critical to your success, and it is almost always worth the effort to save her. Spelunky has so many secrets, such as hidden rooms and characters, that there is *always* something new to discover. I’ll never forget the first time I stumbled upon the black market — a new room where seemingly every item in the game can be purchased. Too bad I didn’t have much gold on me at the time. Now, as this is a roguelike title, the permanent deaths and constant restarts can be an exercise in patience. The obscene difficulty can be a huge turn off at first, but if you stick with it, the game is immensely rewarding. I can’t say I have ever played a game that made me jump for joy just for being able to reach the second world! It takes time to learn the behavior of every enemy, as while as how to avoid booby traps, but with every game you will get better. The game never feels cheap, as everything acts as it is supposed to. Enemies can fall to their death onto a bed of spikes just like you. 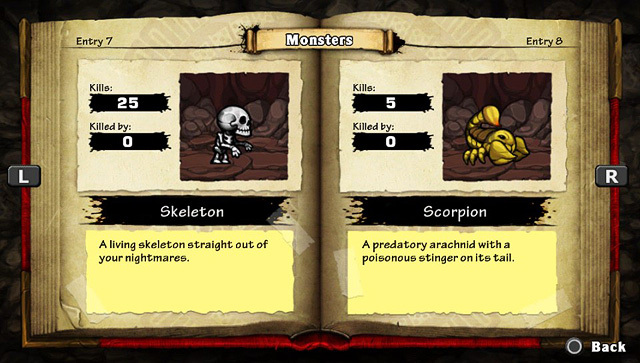 It’s because of these consistencies that Spelunky truly works — it doesn’t resort to cheap tactics to raise its difficulty. Outside of the main adventure mode, there is an option to play deathmatches. This throws four characters into a cramped environment where they fight to the death by throwing bombs, using powerups, etc. It’s basically a throwaway addition to the game, but it can be a fun diversion with friends. One nice perk about the PSN edition is that the game can be played LAN-style between the Vita and PS3. This means that two players can do a co-op campaign with one person using the Vita, and the other playing on the PS3. It’s an incredibly cool addition, and it’s something I would love to see other games do. There is no online multiplayer, unfortunately, but that’s not a huge loss given the game’s splendid local options. 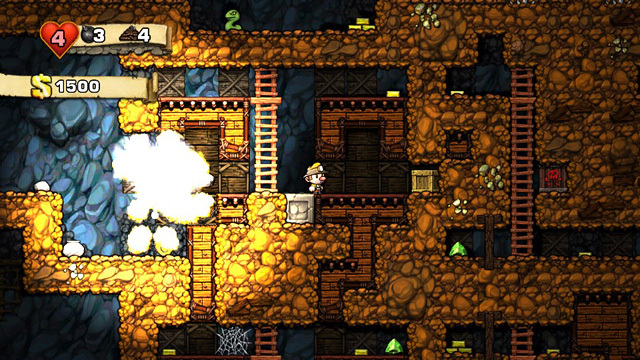 In the end, Spelunky is a clever little title that works perfectly on the Vita. Its addictive exploration gameplay and randomized dungeons offer seemingly endless replay value, and its small download size means it will earn a permanent place on my memory card. There is a demo available so you can try this for yourself, but chances are you will get hooked just like I did. Sounds great, will have to take the demo for a spin. Great review. Thanks man. The demo gives a pretty good idea of what it’s all about — hope you enjoy it as much as I did.